I’ve been building end grain cutting boards for years and using pipe clamps and glue up jigs. Usually very messy and a slight bow developed during glue ups. Well, a fellow LJ member and I have been thinking there has to be a better way. 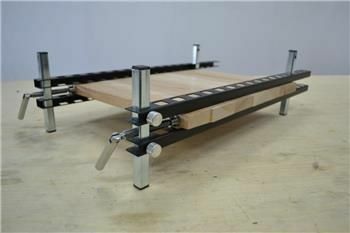 Recently he sent me a link to check out some new clamps, wow, it looks like the perfect solution to cutting board glue up. Here’s a link to a 50 second YouTube video showing an animation of them in action. 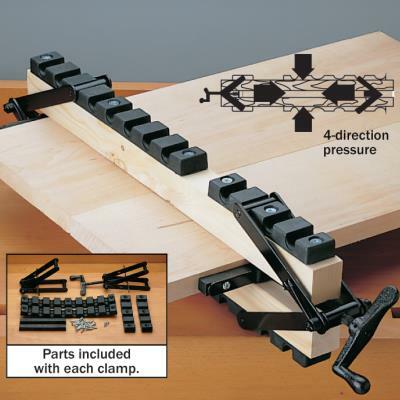 I’m going to order some as to me these clamps look perfect for cutting board glue ups. Does anyone here have experience using them? They look perfect for it. I just recently saw these. Pretty slick looking and they look perfect for what the video shows. Especially since the upper and lower bars look like they be used like clamping cauls. I checked out the video on utube, they certainly look OK. I would be wanting to see a demo of them before buying, there seems to be no locking of the parallel bars at the back. This may not be necessary due to clamping pressure, but I would be putting a G Clamp on the end, just to be sure. Now I am off to find out price and availability in Aust. They appear to be a Korean product but made in Canada. Don’t put fingers between the wooden pieces and the tightening system. Certainly better than the $300 -$400 each for the “Frontline Engineering products. YIKES!!!!! $70.00 each plus all the small parts that can become loose and lost in a shop. Based on the retail cost, it would cost over $2500.00 to replace the clamps I now use. Maybe okay for the occasional user but far too expensive to make sense for a production shop. I am sure there is a far cheaper and equally as effective a way. A review for a product you haven’t even used yet? And five stars, already? Are you serious, CalgaryGeoff? These look like they could be useful for panel/side grain glue-ups, but the biggest problem I have when I do end grain is keeping the slices from swaying or developing a curve. I glue up my end grains a few slices at a time, and the best way to do it I have found is to use a jig with perpendicular edges and clamp to that..allowing you to keep things flat as you go..I never really worry about getting the top perfectly flush because I drum sand anyways after the glue up so slight variations aren’t a big deal..but I do try to keep things as flat as possible. Along with the expense I really don’t see these as a solution..to the problems I experience doing end grain anyways..
Also, I have found that making sure your blank panel is perfectly flat and thicknesses consistently along the entire surface. I learned the hard way that even a slight (1/64) variation in the thickness of the blank from edge to center, adds up quickly to a bow you cant clamp out! My thoughts, exactly. This is a forum post, not a review. Now that I’ve watched the video, not sure how it creates a lot of caul-like pressure with just thumbscrews holding down the cross pieces. The Woodriver (I haven’t used it) forces both down and in with heavy duty screw. Doesn’t look the the Veritas has a mechanism for down pressure other than the serrated post to hold the cauls in place. I just looked more closely at the Woodriver clamps, and it appears that the difficulty with them is that you have screw the clamp to the cauls for each differently sized glue-up. would be way more convenient if you were regularly gluing up identical pieces. Lot of work for someone like me where every glue up is different. +1 to CharlesA’s +1 of Poopiekat’s “Are you serious?” remark. This would make a decent forum discussion, but it’s not a review. Wow, Lots of attention for a tool post. I choose to place this in tool reviews, not a forum cause it’s a tool. It looks like a solution to some of my issues during glue ups and I was sharing it. As far as the 5 star review goes, it was not rated by me, I left it with no stars. Just deal with it boys !! Board smith, I’m looking for a solution to my glue ups, just a hobby shop. Andrew, thanks for the post good idea.